When NVBOTS agreed to pilot the NVPro 3D printer at the Sizer School in Massachusetts, there wasn’t a staff member in the building who had any experience with 3D printing or designing for 3D printing. The Sizer School, formerly the North Central Charter Essential School, is a 7-12 urban public charter school serving about 370 students. Approximately 45 percent of students qualify for free and reduced lunch. The NVBOTS plan to integrate the NVPro 3D printer involved exposing as many students and teachers as possible to it, and taking advantage of how quickly students grasp new technology. The company gave students substantial freedom and responsibility in learning how to use it, and simultaneously trained teachers alongside their students in classes. Three representatives from NVBOTS came to the school to train two teachers who would be given administrative privileges (Teacher-Administrators), as well as six students (Student Printer-Technicians), on the use of the printer. They were recruited from the classes that met in the room where the printer would be located. The printer was placed in a heavily-used science classroom for 11th and 12th grade classes. At least one Student Printer-Technician was present in each of the classes that met in that room. Because a student trained by NVBOTS was available during every period, the students answered questions about the printer and kept watch over it. In addition, the ability to remotely monitor the printer with its webcam was a perfect way to give the students responsibility for the printer in a classroom, while still having a Teacher-Administrator keep tabs on it. Notices went out in all science classes and school bulletins that 3D printing privileges would be given to any student who completed a series of 10 tutorials in Tinkercad (a free online CAD program) and then successfully designed and printed a small coffee mug. These students became known as Tinkercad-Certified Students. Students who completed these tasks were allowed to submit any design for printing. They could also print items not designed by themselves (for example, designs found online). Surprisingly, very few students wanted to print others’ designs. After working through the Tinkercad lessons and coffee mug project, students had the skills to make their own items. The Teacher-Administrator coordinated with each of the 7th grade math teachers to go into their class for three periods and lead this activity. Two upperclassmen, a Student Printer-Technician and a Tinkercad-Certified Student volunteered to act as aides in the classes. Within a few weeks, most of the 7th graders had designed and printed a small open-topped rectangular prism for measuring volume. This activity was the first time the math teachers had worked with CAD software or a 3D printer. Students who successfully completed this activity were given permission to print other designs without going through the Tinkercad lessons. Eventually a similar activity, with cylinders and other shapes, was brought into the 8th grade math classes. After-school hours were set up on a weekly basis for students to drop in and learn to design and print. This became known as The 3D Printer Club. Students in The 3D Printer Club eventually began exploring quite a bit, making heart pendants for Valentine’s Day, replacement parts for broken plastic battery holders, chess pieces, and small vehicles (including a multipart Starship Enterprise). 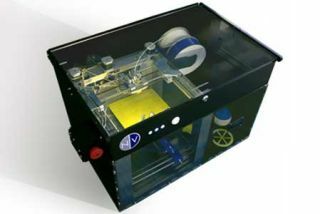 About five months after the printer’s arrival, students who had never used the printer started coming and asking to design items for their classes. Engineering class students were also provided time after school to learn Tinkercad and strongly encouraged to use it during class engineering projects. Some students used the 3D printer to make parts for a scaled boat they were building. In addition, twelve students used the printer to produce game pieces for board games they had designed. What started out as an joint pilot by NVBOTS and Sizer School has advanced learning and engagement broadly at Sizer. By enabling students and teachers to learn 3D design and printing and incorporate it into their daily lesson plans, NVBOTS and Sizer School have created an environment where students and teachers are inspired to learn more, while turning their ideas into realities.